May 2017 – Dc to a "T"
Last summer, frozen rosé, or frosé, became a big trend in cities like New York and DC (Brixton on U Street makes an awesome version, if you’re local and itching to try it!). Over Memorial Day Weekend, I had plans to catch up with a friend on Sunday night and decided to make my own frosé to celebrate! I was thinking about pouring rosé into an ice cube tray and then mixing it in a blender, but after consulting Grace’s recipe, I decided to follow that instead. Rather than using all of the ingredients she lists, I chose to blend strawberries with a small amount of water and pour that into the gallon-sized bag that I’d filled with rosé. I popped the mixture into the freezer for about 6 hours, poured it into glasses, and garnished with a strawberry. While I had been worried that the mixture would be too frozen and would need to be thawed a bit before serving, the consistency was totally fine (thought it wasn’t as smoothie-like as Grace’s appears to have been). So if you’re looking for a fun drink to make for your next gathering or just want to try something new with that bottle of rosé you have lying around, I’d recommend this recipe (if you can even call it that–it’s so simple) 100 percent! If you make your own frosé, let me know how it turns out (my guess is I’ll make this again and again, but maybe with different bottles/flavors of wine–it’s perfect for summer!). If you could name three or four of your favorite items of clothing, what would they be? For me, if I’ve had something for several years and still want wear it all the time, I know it’s a hit. For as long as I can remember, I’ve loved anything patterned, so tops with any sort of print basically dominate my closet (Francesca’s is one of my favorite place to look for printed shirts, btw). But would I call these pieces classics? Nah. They experience too much wear and tear, and certain patterns go in and out of style reaaaal quick. Anyone remember the chevron craze of 2012? I basically owned everything in that pattern–pillows, storage boxes, tops…you name it! One item that I’ve absolutely loved for the past four-plus years is my green J.Crew field jacket (and I also recently purchased the navy version on Poshmark–it’s equally adorable!). I ordered this jacket when I was a senior in college, and it’s held up amazingly throughout the years. It’s great for fall and spring alike (especially with this chilly May we’ve been having) and looks classic, preppy, and put-together. I know literally everyone and their mother owns this jacket, but it’s for good reason! Another favorite purchase would have to be my Hunter boots. I started wearing fun patterned rainboots in high school and discovered Hunters in college. I’m not sure how “in” they are anymore, but most people I know are still wearing them. What’s great is that they’re both cute and functional, which, when it comes to shoes, can be somewhat rare. At the risk of being overly basic, I’m also going to have to pay tribute to my navy Longchamp tote. I’ve loved Longchamps for the past 10-plus years and purchased a large bag in Navy before my junior year in college. I rotate my work bag a ton to switch things up, but I’m currently using the Longchamp and loving it. It holds a ton and is waterproof, which is key for commuting. It’s also trendy without being flashy and I don’t think Longchamps are done yet–I still see plenty of them everywhere! Runners up? A good pair of skinny jeans will take you far, as will a good pair of running shoes. I loved my black Tory Burch flats for years but finally had to “retire” them after they became too torn up. I live in riding boots in the fall and winter, and they’re honestly perfect for work, a night at the bar, a football game, etc. Thankfully I am well stocked in that department–I just scored a new pair on major sale! Popping in again with a few Memorial Day sales you can’t miss! You’ve certainly heard of the usual suspects (J.Crew, Lulu & Georgia, etc) by now, but here are some smaller companies with AMAZING weekend discounts…act fast! JAYES STUDIO (50 percent off all sale items): I ordered two of these caddies in different patterns–one is for my desk at work, and one is for my vanity at home. With the extra 50 percent off discount, each only cost $8 (plus shipping)–talk about a deal! I also love this bamboo tray (but I definitely have enough trays at the moment, haha). However, at $28 PLUS an additional 50 percent off, it definitely is a score! JOANN (lots of great coupons + $1.99 shipping on all orders): I have these palm leaf hand towels and love them. They’d look super cute in the kitchen or hanging on a bar cart. SOCIETY 6 (20 percent off + free shipping): Society6 frequently offers deals, but this is a good one! I order most of my wall art from them, and I’ve never had a bad experience! 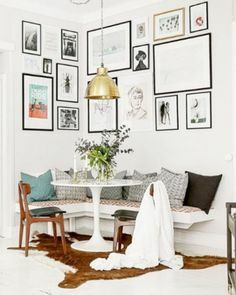 The print shown above is one of my current favorites, #swoon. PBTEEN (various discounts + free shipping): Now could be the time to scoop up this perfect pillow or anything else from the adorable Emily + Meritt collection! KIRKLANDS (additional 25 percent off until 1 pm): Move quickly, y’all! I love this tray (again, don’t need! ), and have purchased several of my table lamps from the site. Happy Memorial Day, y’all! Where has 2017 gone? Not complaining, though, because this time of year means that it’s only a few weeks until summer hours kick in at work…can’t wait to have a little bit of extra time in the afternoon every day! As many of you know, LLBean’s canvas totes are a true summer staple. I’ve had several over the years, and they’ve all held up extremely well. They’re perfect for a pool or beach day, travel, work or school…seriously everything! I knew I wanted to get a new tote for summer, but rather than opting for a traditional monogram, I decided to jazz up my bag a bit with a fun phrase. In the spirit of all things travel, I chose to have “bon voyage” added to my classic navy and white tote…and I absolutely LOVE it! I’ve already gotten a lot of compliments so far, and I love that my tote is unique–although if you were to go ahead and copy me or choose your own phrase, I wouldn’t be too mad 😉 Keep in mind that the first letter of the second word cannot be capitalized, though, so select your phrase accordingly! Other cute phrases could be: Hit the road, Off we go, Out of office, Life’s a beach…let me know if you think of any others! 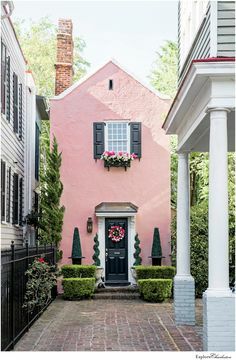 If you follow me on Instagram (or if we’re friends on Facebook), you’ll know that I was so, so thrilled to see my home tour run on The Everygirl yesterday! I’ve been reading The Everygirl for years and love all of their adorable, inspirational articles. 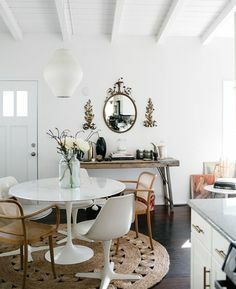 I seriously lust over all of the home tours I’ve seen on the site, so it’s really neat to see my own little space featured alongside so many beautiful spaces! I learned back in February that my tour would run this spring, but I wasn’t exactly sure when (and that’s why some of the answers are a little dated, like the one about my Seattle trip!). When a good friend texted me yesterday morning telling me that the piece was up, I basically freaked out in the best way. 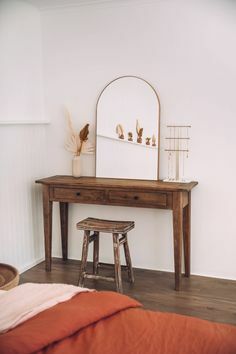 Alsoooo, I’d be lying if I didn’t admit that I’ve redecorated my space a little bit since the piece ran…not too drastically, but I’ve definitely moved some things around and added a few new pieces here and there. I’m supposed to be doing a shoot with another site later this summer, though, so I will update you all on when that happens/runs! Thank you so much for all of your nice comments and support! It’s weirdly scary to share your home on the internet, so I am thankful for all of the positive feedback! <3 I’m also going to add a “home tour” tab above so that you can see all of the features that have run so far! Happy Saturday! If you plan on making some home purchases this weekend, here are a few of my faves…scoop ’em up while the deals last! Get the classic wishbone chair look for only $50 with this replica. Nordstrom’s half yearly sale is HERE and brings with it tons of great home finds, like these preppy pillow shams. This cute towel is another Nordstrom find and screams summer! Take advantage of Waiting on Martha’s Memorial Day Weekend sale and scoop up a cheeky item or two, like this champagne bottle candle. Target is always having holiday weekend sales and this stylish bookshelf is a great buy! On my playlist: Loveeee this remix. On my nightstand: I’ve been a BAD reader lately (blame it on Kimmy Schmidt coming back). But I’m hoping to crush a book or two over the long weekend! On my mind: I was devastated to hear about the attacks in Manchester on Monday night. Thinking of all of those who lost loved ones and are living in fear due to this terrible event. On my wish list: Um, this J.Crew top is absolutely perfect. And so are these shorts. On the agenda: Drinks with a new friend tonight, going out with another friend this weekend (we decided to purchase these “passports” which allow you to buy 2-for-1 drinks at a number of DC bars…SUCH a good deal if you ask me! They have ’em in several cities; see if yours is on there.). Plus sleeping in, workouts, reading, blogging…long weekends are for catching up on life, if you ask me! For as much as I love decorating, I wouldn’t say my desk area is too exciting (though I’ve actually seen some super cute cubicles/office spaces on Instagram!). However, I try to make sure it’s always stocked with the essentials (plus one or two fun things, just because!). I always find it interesting to see what other people keep in their work bag or on their desk, and most of the time I see something mentioned that may seem completely obvious but totally slipped my mind. So…if you’re nosy like me or are starting a new job and don’t know what to bring, this is for you! The most important thing on here? In my opinion, it would have to be the water bottle. I did a really bad job of drinking enough water during the day while at my first job out of college, and I ended up getting sick a lot because of it! I was constantly busy, had little time to get up and refill a bottle (and inevitably run to the bathroom) and did a terrible job at drinking enough during the day. It’s still something I struggle with (water is just so blah to me! ), but I’ve done a much better job and am always so much happier when I don’t have a headache at the end of the day! I’m also big on being well-prepared when it comes to things like bandaids, Advil, lip balm, etc. Everyone in my current office is big on brushing teeth all the time, and I always keep a travel-sized toothbrush on hand in my bag! 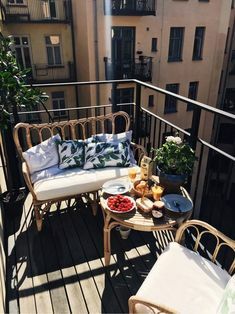 It’s honestly perfect for when we have dinner events and I just need to freshen up a bit. Snacks are also key for stations like this when you can’t go home before an event starts but just cannot make it from noon to 6 pm without becoming absolutely hangry (anyone else get this way?). Protein bars are also perfect for mornings when breakfast just isn’t happening at home. You can always find me with a notebook (and a planner for that matter…I write everything down by hand! ), and you just can’t go wrong with a cute business card holder and pouch (seriously, how perfect is this brand?! Reminds me of Kate Spade!). When I lived in New York, I remember one of my friends asking if I thought it was tacky to have NYC-themed decor hanging up in her apartment. I mean, the city was right outside her front door…did it make sense to also have a New York-themed poster? However, there are tons of tasteful ways to incorporate hometown-themed decor into your apartment without looking like a permanent tourist! 😉 I personally own several DC-themed prints and wanted to share a roundup of a few of my faves! Oh, and number 5 is only $5! 1) Swap out your art. I have a huge gallery wall above my couch, and this makes it super easy to mix things up from time to time. No need to buy new frames–just toss a new print if you’re looking to change a room’s theme or color scheme. Prints can be super affordable if you download them yourself or repurpose greeting cards, wallpaper samples, and the like. Redecorating has never been so easy! 2) Move your furniture around. This Instagram quote is entirely applicable to my life. I move things around wayyyy too frequently but always end up loving what I do. Yes, it can be hard to move/lift heavy items by myself, especially when living in a small apartment, but I’ve become quite skilled 😉 The key is to remove heavy items or even take out drawers when possible and to be careful so as not to scratch or dent a piece of furniture while lifting it (or sliding it, as is the case for me sometimes) across the room. 3) Add a new accessory. 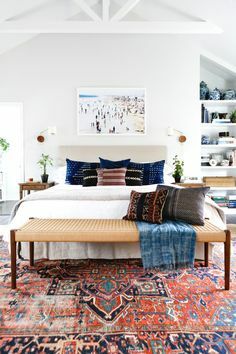 Small items like lamps and area rugs can really pack a punch without costing too much or taking up too much room. If you love chinoiserie, look for a ginger jar-like lamp, or if you’re trying to create a modern living area, opt for one of these (or you can mix styles like I did above!). You’ll be surprised at how much something small like this can transform a room! Or maybe a new comforter or a set of throw pillows will give your bedroom a completely new look. 4) Clean, clean, clean. Maybe you don’t really need to redecorate at all! Tossing/selling/organizing unwanted or bulky items can really change a room or apartment for the better. I recently re-organized my shoes in my front closet and it’s so much cleaner in there. And here I thought I needed some fancy storage system! I also bought an under-bed bag from HomeGoods that has been a game changer (anyone else store stuff under there?!). Cleaning and organizing is definitely not a “once a year” or even “once a season” activity, though. I’m constantly evaluating whether I still need things or if it’s time to take them down to the consignment shop or donation area at my office. 5) If you really want an entirely new look…Maybe moving around a few pieces of furniture just won’t cut it for you! 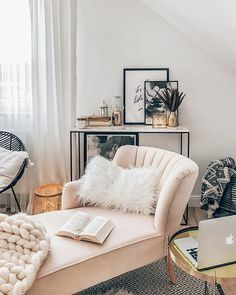 If you simply want to start the decorating process from scratch, anyone will tell you that Pinterest is an incredible resource when it comes to identifying your style, and I completely agree. I also personally enjoy matching my style to the place in which I’m living, but that’s just something that I find fun! When looking at older buildings in Georgetown, I was definitely drawn to the “rustic glam” look. However, if I were to live in a high rise, I may opt for more modern furniture and decor. 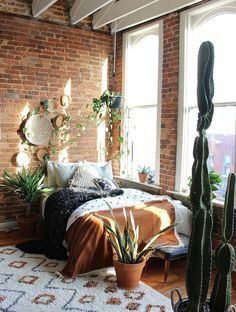 This obviously isn’t necessary, but you might be surprised how your living environment informs your decorating choices!